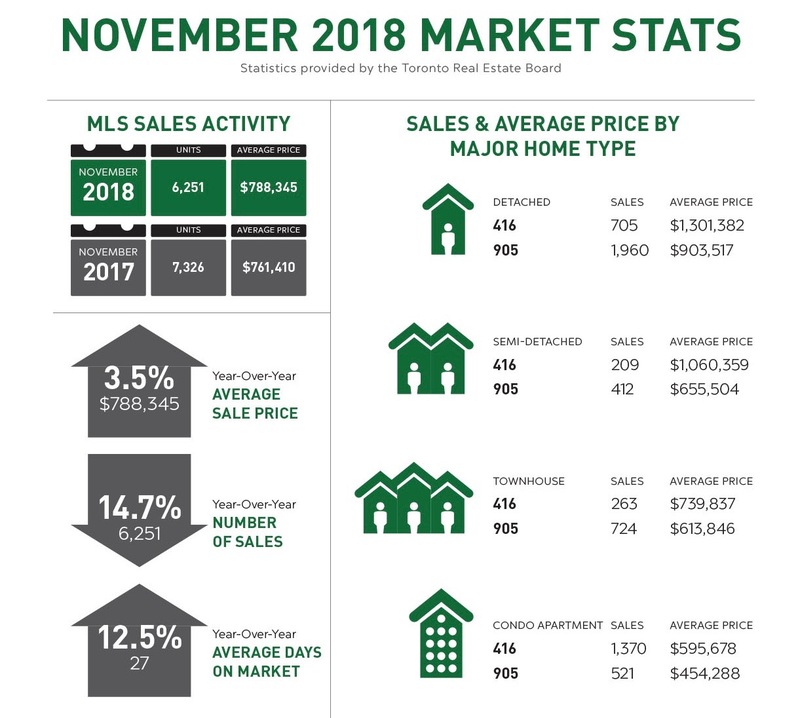 5,025 home sales were reported through the Toronto Real Estate Board MLS in February 2019, down by 2.4 per cent compared to February 2018. The average selling price for all home types combined was up by 1.6 per cent over the same period. The semi-detached segment was the best performer, with average prices rising 9.9 per cent on the year and condos continue to trend as a positive driver of year-over-year price growth. A decline of 6.2 per cent for new listings from a year earlier, however, is a concerning statistic that industry analysts suggest is being driven by the OSFI mortgage rules that are keeping buyers on the sidelines. A total of 77,426 residential transactions flowed through the TREB MLS in 2018 with an overall average selling price of $787,300 for all home types combined in the TREB market area that includes both the 416 and 905 areas. These numbers compared to 2017 translate into declines of 16.1 per cent in sales and 4.3 per cent in price. Despite overall declines, the condo market segment in both the 416 and 905 bucked the trend with average sales up by 7.8 per cent and average prices up by just over 8 per cent year over year. The volume of sales and positive price increases of this home type reflects a move of GTA home buyers in 2018 to more affordable home ownership options. November 2018 saw a 14.7 per cent drop in sales compared to November of 2017. Lower sales activity for the month year over year was anticipated as the looming imposition of new mortgage stress-test in January 2018 fueled a spike in sales activity at the end of 2017 from buyers wanting avoid the tougher rules. With the number of active listings down by 9.8 per cent year over year and a drop of 26.1 per cent in new listings for the period, lack of inventory continues be a key market influencer, pushing home prices up by 3.5%. Sale prices for lower-priced housing options such as condos, townhouses, and semi-detached properties continued to show steady increases as influenced by the mortgage stress test restrictions and higher borrowing costs.